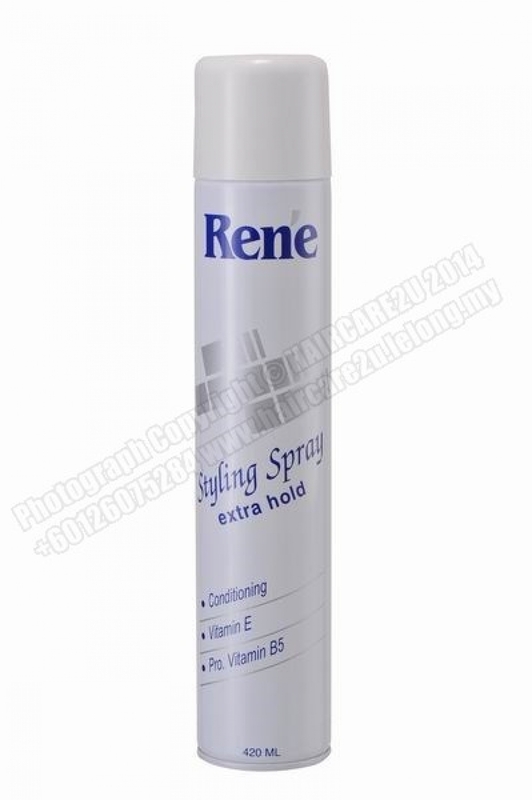 RENE HAIR STYLING SPRAY with EXTRA HOLD is the true professional hair spray, acts well under any adverse weather conditions. Its strong fixing qualities holds styles in place and allows easy style desiging or hair sculpturing without causing stiffness or flaking. It is crystal clear, water soluble and dries quickly without stickiness. It is mildly fragrant to compliment your perfume and excellent for use after a perm or a hair tint. Hold can upright with valve in right direction about 10"-14" from hair, spray lightly on entire head after comb or brush out.